I don’t think I could’ve ever been quite prepared to handle all the emotions that accompanied me during our three week trek around Tanzania. 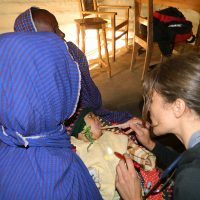 I was working with a group from a Canadian Charity, Project Tanzania, and it was everyone’s first experience in Africa. Helping in Africa has always been a dream of mine and with dreams come expectations and often false visions of realities. As a young doctor it is always a bit unnerving stepping into new medical territory. It was easy to wonder if my training was enough, and if only reading about these conditions would guide me in the right direction. Medicine, as in any profession, is about experience, I just had to hope I would be as prepared as possible stepping into this very fragile environment. I have traveled to several third world countries, but Africa is unlike any other. A place so wild, so raw, so mysterious and so stuck in the past; it is very different from the rest. Of course the need was so great I had to limit my idealistic desires to help everyone. With poverty a true reality for many and medical care a true luxury for most, we had our job cut out for us. The Angaloni outpost station, outside of Arusha, would be my medical clinic for the first few days in Tanzania. Due to the insurmountable need for care, we restricted help to those most in need. Lung conditions were rampant as the constant dust storms were enough to clog all orifices and irritate tissue. The Maasai huts, called bomas, also contained no windows and they would burn fires inside, leaving fragile lung tissue very susceptible. As if that weren’t enough, tuberculosis was a common infection and several patients had to be referred to local hospitals for management. Other complaints consisted of children with bacterial and fungal infections, women with pains in their joints from their necessary hard labor, HIV co-infections, skin infections and parasitic infections to name a few. Fortunately I was prepared to help most of the concerns as best as I could or was able to facilitate transport to the local hospital if necessary. The final day of treatment took us into the slums of Arusha, where thousands lived huddled together in tin boxes. My most particular heart wrenching moment came when I was brought a young girl who was in the end stages of AIDS. She had been banished to the back room of her grandparent’s home her whole life unable to socialize or go to school. This behavior was due to the misconception that her disease was an embarrassment for the family and she should not be allowed out. She was 11 or 12 when I met her and unfortunately did not have long to live. The old wive’s tales are killing Africans just as quickly as the diseases. 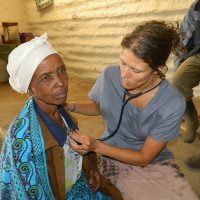 Fortunately for the others, medicines are relatively inexpensive once proper diagnoses are made and I believe we were able to help many get better. I’d be lying if I said I thought we could make a big impact in Africa. My surprising conclusion after being there was that we must keep aid small, specific, and focused on the only hope these people really have: education. The truth is the African paradigm is complicated, to say the least, but aid is warranted and necessary in the right context.